The Honda Odyssey was launched for the 1995 model year. Basically a glorified wagon and based on the Accord, the first generation Odyssey equipped with a four cylinder engine and having rear doors similar to the Accord rather than sliding doors known to be standard equipment on today's models. The basic vehicle was shared between the Japanese and North American markets. The Odyssey was also the first minivan to have a flat-folding third row seat. The second generation Odyssey was designed for the North American market for the 1999 model year. This generation Honda Odyssey is the more well known styling and allowed Honda to firmly define itself as a true mini van contender. The Odyssey in 1999 came with standard rear air conditioning, third row roll away seating, dual sliding side doors and a powerful 3.5 litre V6 motor. 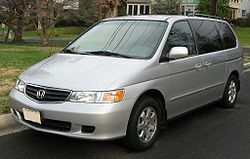 The third generation came to market as a 2005 Honda Odyssey. In keeping with its large and comfortable lineage the Honda Odyssey in the third generation continued with its 3.5 litre V6 powerplant, this time producing more horsepower and achieving better fuel economy. The economy was in part thanks to the Honda Odyssey's optional VCM (variable cylinder management) system. Honda also kept its fold away third row seating, but enhanced the feature by allowing it to be a split seat. The Honda Odyssey has had a very good reliability ratings throughout all its various configurations, but as with all mechanical products it has had a few misteps along the way. Here is a list of the most common from generation to generation and a link to their recalls and technical service bulletins. Some models have had problems where the transmission may have a torque converter or computer (torque convertor) issue and in both scenerios the the Check Engine Light may turn on. Repair to the transmission or computer may repair the issue. Motors that have overheated commonly have head gasket failures. A running hot motor is a symptom of a failed head gasket. Only replacement of a failed head gasket will fix this issue. A seal around the balance shaft commonly becomes loose and may become detatched, causing a large oil leak. A service is available to prevent the seal from falling out, which many people have had done during a timing belt service. Distributors with high miles on them may leak oil. Engines misfiring are a common problem with this issue. Replacment of the distributor is the only cure for this ailment. The fuel gauge on certain models will not show a full fuel tank due to excessive resistance in the sending unit. You will have to replace the sending unit to fix this problem. Issues with the A/C evaporators are common due to the age of the vehicles. Leaks, foul smells from mold and waterleaking into the passenger compartment from a drain being clogged are the most common. Having the A/C serviced regularily may aleviate most problems. Some engines have had oil leaks from a porous block casting. The front stabilizer links have been known to clunk. Replacment will fix this issue. The clock light commonly burns out. Thee are common issues with the EGR valve.This can make the check engine light turn on. An issue with IAC valve may make the engine to surge and turn on the check engine light. Replacment of the valve will repair this issue. A broken rear engine mount may cause a vibration. Replacing the mount can fix this issue. The Powertrain Control Module sometimes misreads information from a coolant sensor which can turn on the check engine light. There is an update from Honda for this issue. Bad front wheel bearings have been known to cause excessive noise.. Replacment of both wheel bearings will alleviate the noise. The sliding doors have been known not to open all the way because the warning system misreads that the window is open. Replacing the window regulator will fix this issue.